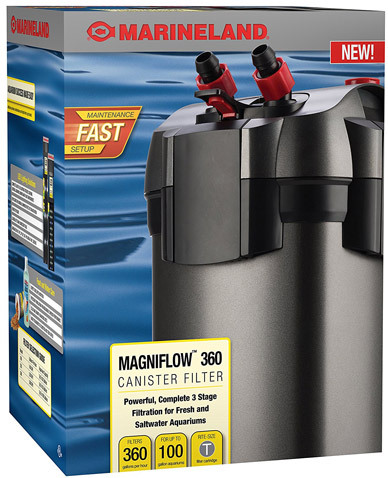 With all the benefits that a canister filter offers, every demanding aquarium needs one. An external filter allows superior filtration and a stronger flow than most other filter types. But there are many different canister filter brands and models out there, each one with different features and specifications. Which one is the best choice for your aquarium? To help you with your decision, we compiled a list of our 5 best canister filters on the market. The best canister filters in our review are the Fluval FX6, the Penn Plax Cascade filter, and the Eheim 2217 canister filter. The flow rate represents the amount of water that a filter can circulate per hour. It greatly affects the purity and clarity of your water. 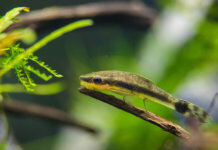 While a canister filter with some extra flow won’t harm your fish, an external filter with a weak flow rate can definitely cause a number of issues down the road. The ideal flow rate number varies from person to person, and depends on the size and construction of the filter. We’ve found that for the best results your canister filter should have a flow rate of about 2 times the size of your fish tank. For example, a 55 gallon tank would require a flow rate of at least 110 gallons per hour. The main benefit of a canister filter is the sheer amount of filter media that it can hold. As water passes through the filter, dirt, impurities, and various toxins are caught and dissolved within the media. Not only is more media always better – a canister filter also allows you to create a custom mix of biological, mechanical, and chemical media – which is extremely beneficial. 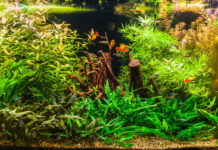 You can combine the right types of media depending on the size of your tank, the number of your fish, and various other factors. 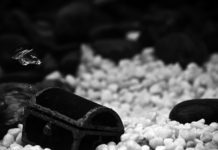 Regular filter maintenance is a must for a healthy fish tank. Depending on your aquarium, you may have to take your canister filter apart once every 3 – 5 weeks. The process is tedious – but some canister filters are easier to clean than others. We put an emphasis on ease of maintenance while reviewing our top 5 best canister filters. We liked: Excellent filtration and capacity. Many useful features. We didn’t like: More expensive than many alternatives. Our #1 best canister filter. The Fluval FX6 offers impressive specs, good quality, and comes with a number of features that put it above the competition. The FX6 has more flow, capacity, and operates more smoothly that most filters that we’ve tried so far. It has an insane output of up to 925 gallons per hour, and can fully re-circulate up to 563 gallons of water per hour. Fluval’s aquarium filter can confidently handle fish tanks up to 400 gallons. 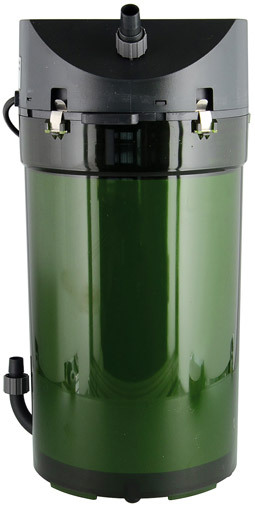 This canister filter has a total of three media baskets, which can hold up to 5.9 liters (1.5 US gallons) of filter media. We found that the inner trays are solid, well-assembled, and leave little space for water to bypass the actual media. 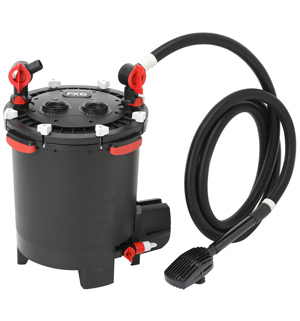 This ensures that all debris, dust, and gunk is caught within the filter – instead of being regurgitated back into your aquarium. Fluval’s patented “Smart Pump” technology constantly monitors the filters operations. The filter evacuates trapped air periodically, and shuts the impeller down if it’s impeded. The same technology manages the filters self-priming feature; the FX6 fills with water and evacuates trapped air as soon as it’s plugged in. We liked: Five trays for filter media. We didn’t like: Doesn’t match the performance of some competitors. While this filter doesn’t have the same raw power as Fluval’s FX6, it compensates with the large amount of filter media it can hold. The Penn Plax Cascade filter has a total of five media baskets, allowing you to to create a powerful combination of biological, mechanical, or chemical media. Not only does Cascade’s large capacity ensure better filtration – it also gives some leeway with maintenance, allowing longer periods between cleaning. Priming the Cascade filter is relatively easy – a push-button primer will evacuate the air and get the water flowing after just a few pushes. 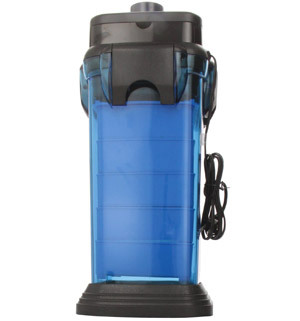 Additionally, the body of this external filter is mounted on a thick, rubber base. This adds more stability to its long body, and prevents tipping. 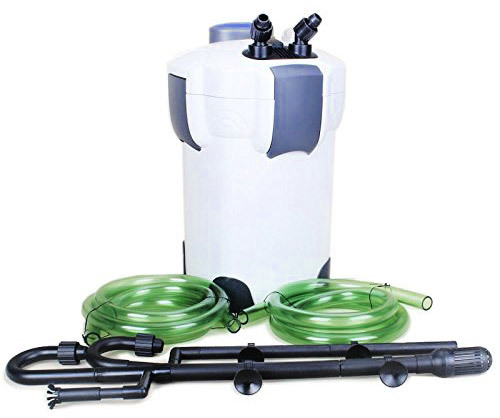 You can fully rotate the valves which connect the tubing to the canister; a nice addition which makes placement easier. 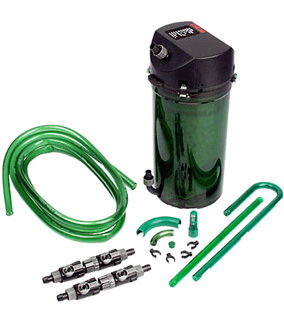 This canister filter is 20.5″ tall, and has a flow rate of up to 350 GPH. We liked: Durable, well-built, and efficient. We didn’t like: Lacks many features that most competitors have. For decades, Eheim canister filters have been known for their reliability and performance. The Eheim 2217 is a true old-school aquarium filter, featuring an extremely simple design, and just one, large media chamber. The Eheim 2217 has a flow rate of 264 GPH, and can handle tanks up to 160 gallons. While the lack of any media baskets can make maintenance harder, the single-chamber design allows much more flex when stocking up on filter media. While it lacks any particular features, the Eheim 2217 stands out in durability. Eheim filters are known for being able to last for decades, and this filter comes with a 24 month warranty. Some fish keepers may find the price to be too high for such a simple design. We believe that the Eheim 2217 is well worth it. A canister filter plays should, above all else, be reliable – something that the Eheim filter is good at. 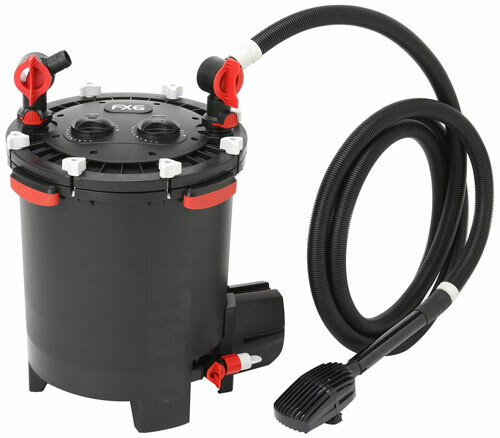 If you have a medium-sized aquarium of 40 gallons or less, the Eheim 2213 model from the same line offers the same quality, but with a weaker flow rate and less capacity. We liked: Water-tight sealing. Seems solid and sturdy. An overall decent fish tank filter. 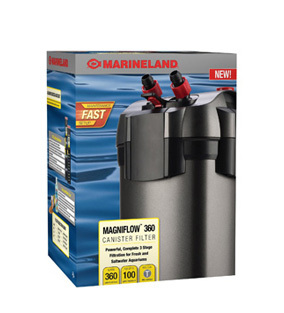 Marineland’s Magniflow 360 filter is rated for fish tanks up to 100 gallons, and has a flow rate of up to 360GPH. The lid of the canister has a water-tight seal. The filter comes with a sealing that, when sealed into the lid, prevents spillage. While this is a nice addition, the lid should be handled with precision – failing to install the gasket correctly could result in leakage. As far as noise goes, we found that this aquarium filter makes a soft, low-profile humming which is easy to get used to. The construction itself seems solid and sturdy. Similarly to the Cascade filter, the Magniflow line comes with a priming button to ensure an easier start-up; no manual siphoning is required to start this filter. If you’ve opted for a Magniflow, but have a medium-sized fish tank, we suggest the Magniflow 220 model. 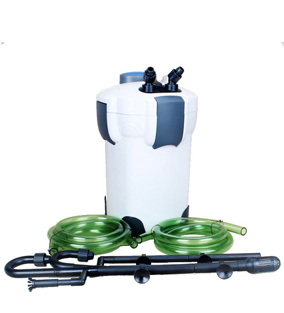 It’s recommended for aquariums up to 55 gallons, and has a flow rate of 220GPH. We liked: Excellent price-to-quality ratio. We didn’t like: Doesn’t seem as durable as some other canister filters we reviewed. A great choice if you need a strong filter, but are on a budget. It doesn’t seem as durable as some high-end aquarium filters – but when specs are compared, SunSun goes toe-to-toe with many larger brands. The SunSun HW 304B has a flow rate of up to 525 gallons per hour – which is impressive. Comparison-wise, the Cascade 1500 filter offers 350GPH, and the Eheim 2217 offers 264 GPH. Although it’s just 17″ tall, the SunSun canister filter has a total of 4 media baskets. 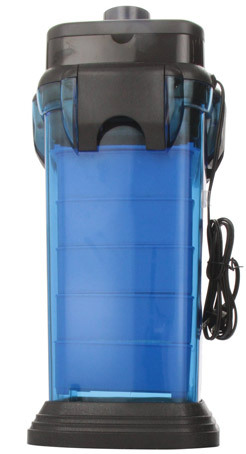 It includes a 9W UV algae sterilizer, which, while weak, can still help with algae problems. Similarly to the Cascade 1500, the SunSun aquarium filter has a priming button that ensures a painless priming process. The biggest issue we had with this filter was the construction. The plastic looks a bit brittle, and doesn’t seem as reliable as most other filters from our review. Despite this, we believe the SunSun canister filter offers great value for its price.